As this post mentions Punakaiki Fund Limited it could be construed as an advertisement for our public offer for New Zealand residents. So here is the link to the Product Disclosure Statement and you can invest online at Snowball Effect or directly with us. But I want to dive deeper into the potential impacts for New Zealand, which are not all that bad, jokes about US emigration to New Zealand aside. The guiding presumption is that Trump will downplay some of his more radical rhetoric – especially his foreign policy statements implying he would use nuclear weapons. If that happens then all bets are off, but he is a lot smarter and will be better advised than his campaign would lead us to believe. Trump’s Contract with the American Voter is a good read to determine what we are potentially in for. Trump wants to propose a constitutional amendment for term limits for congress members – but that will be very hard to get past those congress people themselves. The perverse result would anyway be more power to the funders, rather than less. 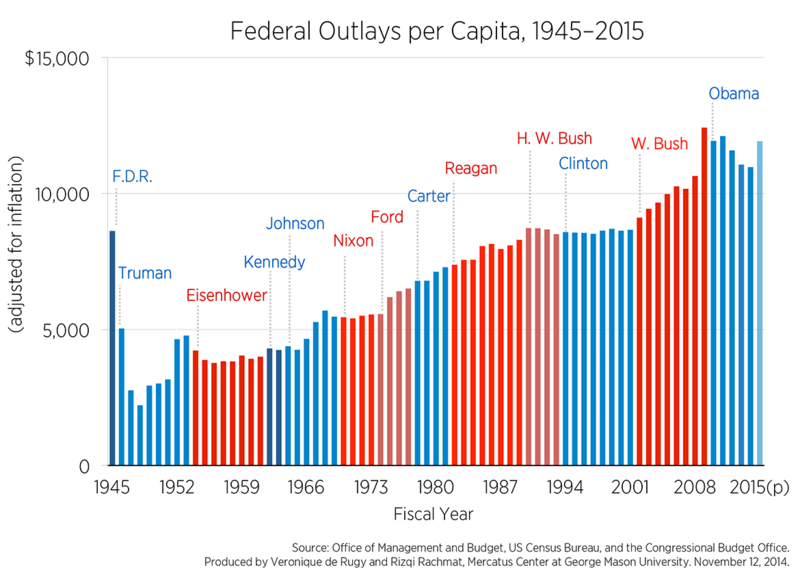 He also wants to reduce the payroll to government, which every Republican president wants to do and few to none have ever achieved, as the chart below makes clear. Obama is the only recent president to lower the number of public sector jobs. Trump also wants to renegotiate or exit NAFTA, label China a currency manipulator (which will kick in trade barriers) and not sign the TPP. These are all doable – even NAFTA, which requires use a letter and six months notice to the two counter parties. Trump will also remove environmental protections, unleash development of fossil fuel projects and cease climate change mitigation efforts. He intends, and with a Republican Congress he is likely to, to lower the corporate tax rate to 15%, allow offshore funds to be repatriated at 10% tax and lower tax for rich people. That will be an interesting trick considering the promise to increase spend on military and a need to not overspend too much. On the other hand increasing deficits when long term interest rates are so low is not silly at all. Obamacare is for the chop, but neither Trump nor Republicans have any credible alternative yet, so expect turmoil and plans written by health care industry lobbyists to dominate. Trump also promises to make FDA drug approvals faster, which has good and bad implications. Finally there are a number of anti-immigration measures, including the fabled wall, deporting 2 million people, tighter immigration checks and suspending immigration from “terror-prone regions.” These have a concerning police-state overtone. There is more, including changing the balance of power in the Supreme Court, funding for non-public schools, tax deductions for childcare and eldercare and PPP programs to invest $1 trillion in infrastructure. That last one could be interesting – the USA’s transport infrastructure, for example, is long overdue for an overhaul. It’s not all workable – but elements will certainly get through. Beyond the 100 day plan Trump has incited racism, sexism and a general anti-education sentiment in the USA. It’s worrying to think about where this will end, and the USA certainly has unfinished business with slavery, the civil war and indigenous Americans. The main potential implications for New Zealand, I see, are changes in the US economy, changes in trade barriers and climate change mitigation progress. The other policies, while huge domestically in the US, do not really change things in New Zealand. We do, however, have to be aware of and deal very quickly with the real issues that Trump and Brexit voters are concerned about, lest we fall in the same direction. That’s up to all of the political parties here, and National especially as the government. They are doing remarkably well for a 3rd term right of centre government, but more is required. We are lucky to live in one of (if not the) best places in the world, and our politicians do care about social issues as well as driving business. A change in the US economy would affect demand for imports, global investment returns and pricing of local investments. The economy is due for some turmoil but overall Trump is a pro-business president. The policies he is pushing for, along with the Republican House and Senate, will defang or remove business oriented regulations, like environmental and safety mandates. Those taxes on business and high net worth individuals will fall and little to change in reality for Wall Street. On the downside some sectors and people will suffer, in particular businesses exposed to elements of health care, the environmental sector and, more critically, people with low income who need government support. It’s a strongly held belief by many Republicans n power that cutting taxes at the expense of social payments is a good, and as Trump’s budget is ludicrous something has to give. Meanwhile other sectors will boom, including, at least temporarily, industry exposed to fossil fuels and those infrastructure projects. The US Equities Markets will be fine in the short to medium term. Investors are realising this, and, despite the dismay at Trump’s election, share prices are rebounding. Indeed it would be surprising for a billionaire to do much to cripple the global investment markets – as that’s the primary way for billionaires to make money. I would not be surprised to see some market volatility as the reality of Trump’s appointees and policies become clearer over the next few months. But despite his rhetoric I don’t expect to see a sabre-toothed regulator placed over Wall Street, and expect other “business friendly” policies to emerge. I put business friendly in quotes as defanging regulators is a short term move – and tends to foster crises later on. Meanwhile the sheer size of the US economy is hard to grasp sometimes. Their GDP is over $18.565 Trillion, and increased by $509 billion in the last year. Let that sink in – the USA grew, at $509 billion, by 2.8 times the size of New Zealand’s own GDP last year. The US GDP itself is 100 times as big as New Zealand’s GDP and the market is bottomless for New Zealand exporters. A change in the trade barriers would affect New Zealand’s relative ability to export and get good margins for products and (to a lessor extent) services in the USA. Companies marketing to the US do so because of that vast economy size size. The economy growth rate is a relatively trivial factor versus the addressable market. What’s more important is the confidence that US buyers have. New Zealand companies exporting to the US often do so on a basis of delivering something that is better and cheaper, and it’s in tough and turbulent times when buyers are looking for alternatives. So if times get tough we can rely on the size of the US market and hungry buyers looking for alternatives, and it times are good – well then times are good. Trump wants to tear up trade agreements, and that means we can expect to see high tariffs on imports. While that’s going to affect New Zealand companies exporting to the USA, our existing trade agreements with the USA are not that great anyway. Given that we have a poorer deals than Canada, Mexico or even Australia then we will gain comparatively if they are broken and the stasis quo remains with New Zealand. The TPP won’t pass, although we could be surprised. It was a poor trade agreement per se, and especially for us as it skewed sharply to the USA with, for example, chilling copyright provisions dictated by the MPAA and RIAA. Overall it seemed too complex to deliver the comparative advantage to each country – economic benefits that Adam Smith and David Ricardo rightly pointed 200 years or more ago. Perhaps we now have the opportunity to recast TPP a treaty for the remaining countries, removing the US-imposed clauses before that happens, and adding maybe some more protection for domestic workers in each country. New Zealand could even take the lead on this, redrafting a simplified agreement that leaves in the benefits granted to every other country but takes out those demanded by the USA. Net net – I see that New Zealand exporters of physical goods may be affected, and especially commodity exporters. But commodity exporters have it coming, and they should at least be well diversified, but more importantly adding more value to their products. (Fonterra – please call Lewis Road Dairy and ask about their margins.) High value products are less affected by price and tariffs, so it’s another nudge to New Zealand exporters to move up the value chain. Companies selling mainly services, such as SaaS, should not be affected, as these are too easy to deliver from anywhere without barrier. Early signs for one hardware exporter that I know well are good – their own distributors are very positive about the future, perhaps seeing less regulation and tax as driving their businesses forward faster. Trump’s climate change denialism is real – he has been consistent on this for years. Coupled with a Republican House and Senate, many of whom are who are underwritten by the Koch brothers, we can see that regression is certain. The impact on New Zealand is the global impact – the loss of momentum to lower emissions and the acceleration of sea rise, extreme weather events and loss of habitat. On the positive side, however, it’s increasingly clear that the switch from fossil fuels is becoming realistic without subsidies – especially if subsidies to the older industries were removed. Tesla and Wrightspeed are showing the way to a electric future that delivers better products (like faster cars), cheaper costs and reduced emissions. The price of solar generated power is falling fast, and once installed they are there forever. States, like California, meanwhile can and will keep their own incentives for lower emission approaches. Here in New Zealand there is little we can do about the climate change policies of the USA – except for leadership by example. We do not have the funds to invest in the next Tesla, but we do have the ability to nudge, as Vector is doing, to a better future. The high growth New Zealand based companies that are doing business in the USA, and I am not constraining this to those with Punakaiki Fund investment, are succeeding because they are providing disruptive services. A disruptive product or service does well in a disrupted society, as buyers are looking for change. Pushpay provides alternative easy payment mechanisms, Melon Health lowers the cost to insurers paying for delivering health care, Vend makes it easy for stores to set up and expand and Xero changes the way the accounts are done, while reducing costs. There will be category winners and losers, absolutely, with Orion Health’s share price affected today, but overall high growth companies are far more concerned about the next sale than the overall economy. They are, like every company, potentially affected by exchange rates. But it works both ways, as if the USD falls versus the Kiwi then we will probably see other currencies rise to compensate. Companies will also see benefit in reduced costs, especially for high cost things like Amazon Web Services (AWS). Above all this shows, as Brexit did, that it pays to diversify your markets. Punakaiki Fund’s portfolio is only abut 15% exposed to the US market, so we are not expecting any material change. And for those bashing Xero’s relatively slow uptake in the USA – the same benefit applies to them. However so far we’ve seen little negative change in currency rates or market indicators, but I feel for the people of the USA. This post is about the effect on business here in New Zealand, but I worry deeply about the effects of the divisive campaign led by Trump. Thank you Lance. 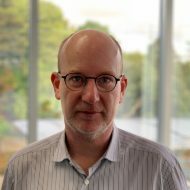 I have been struggling to compute the complexity of the issues and the implications for business in New Zealand. Out of all I have read this last six weeks, this is the analysis that has made the most sense. It is realistic and grounded. I confess to feeling quite ‘inflamed’ about the Trump Election but flayling for an answer, or an outcome. Your rationalisation has quelled that somewhat. I may, ha, sleep tonight. I worry about the world and I couldn’t see a way through finding peace and acceptance of how this could be a good thing. Thanks Lance. Good article Lance, always thought provoking. Let’s wait and see what transpires once Trump is in the Chair. In the meantime, those of us who are in the U.S. market are working through the implications you’ve outlined. Personally, for New Zealand expansion stage companies, I remain optimistic based on our focus on agility and speed. U.S. side relationships are key. It also reinforces that having a diversified (international) market strategy is for moments like these.